We are pleased to have concluded our very successful 2017 Annual EthosCE User Conference in San Francisco, CA on January 24. The event is designed to bring together our medical association, academic health centers, and insurance clients to discuss: new EthosCE LMS features, for participants and presenters to share Best Practices, and advance the EthosCE Product Map for the future. This year we were joined by a wonderful panel of presenters from the CME community to share how they are leveraging EthosCE to advance the delivery of continuing education in the health professions. The presentations sparked significant discussion among attendees and highlighted some impressive metrics and models for people to take back to their organizations. Organizations have to break down internal silos and develop a cross sectional structure that encourages collaboration, communication and idea innovation. Employ a strategic vs. tactical approach to your educational design. Take an inventory of educational content and assess the success current revenue streams. Look at what education products are not selling (even if they are leadership’s “pet projects”) and cut them. Focus your efforts on the most successful. The start to think like an entrepreneur: How can you re-purpose, bundle, license, etc. your content? You work hard to develop excellent clinical content, get creative and see where you can develop new review streams in digital, print and live meeting. If you don’t have access to marketing people or a marketing department, look to the many free and low cost options on social media (e.g., LinkedIn, Twitter) and the web. But you have to market! Rob spoke about exciting models and case studies for revenue generation in CME. Look for a webcast of his presentation coming soon in the EthosCE Webinar Series. Next, Vanessa Ross, Director of Continuing Medical Education at Des Moines University presented how she is using EthosCE to completely transform and automate her Osteopathic Residency Training Program. In a department of two CME professionals serving a large population of health care providers, Vanessa’s team was getting swamped with manual documentation requirements especially around her credit management for her AOA preceptorship residency rotation program. Using EthosCE’s Webforms, Vanessa was able to completely automate Des Moines’ preceptorship CME credit tracking and reporting. Vanessa called the auto-email feature, “one of the best things ever!” It changed her office from having to take 24 calls a week to only 8 calls during a 3-month period. Watch the below training video that the CME department produced to introduce EthosCE to their physician audience. Finally, the day concluded with an in-depth presentation by the University of Chicago Center for Continuing Medical Education’s Tom Weber and Caitlin Dale discussing how EthosCE automated and streamlined the management of their Regularly Scheduled Series (i.e., Grand Rounds). Prior to the EthosCE implementation, the Center for Continuing Medical Education manually tracked attendance at Grand Rounds and was inundated with constant emails and faxes requesting a CME credit certificate. According to the presenters, “Our fax machine never stopped. All day. Everyday. The amount of staff resources that were required to meet the demands of our physician population was overwhelming.” The University of Chicago implemented EthosCE’s Regularly Scheduled Series Attendance Module which leverages mobile SMS text messaging technology to automate attendance tracking and eliminate paper sign in sheets and manual entry. All required documentation (e.g., location, date, topic, conflict of interest) is collected and stored in the application. Upon approval, a session is created with a unique SMS text message ID number. The SMS session ID number is then given out upon the conclusion of the Grand Rounds. Attendees then text the unique ID number to EthosCE where the system then locates the physician’s transcript and marks them as “Attended” within the system. With the U of C leadership team, EthosCE was able to completely streamline the University of Chicago Center for Continuing Medical Education’s Regular Schedule Series to the point where “we turned off our fax machine.” “EthosCE does a really great job with RSS,” said Tom. Tom and Caitlin also discussed best practices for training RSS Coordinators across the health system. Primary recommendations were: train in small groups, develop “Super Administrators” to reinforce training, and be realistic about the amount of time per training session. We could not be more pleased with the level of participation, the quality of the data and case studies from our presenters, and the engaging discussions sparked by participants. 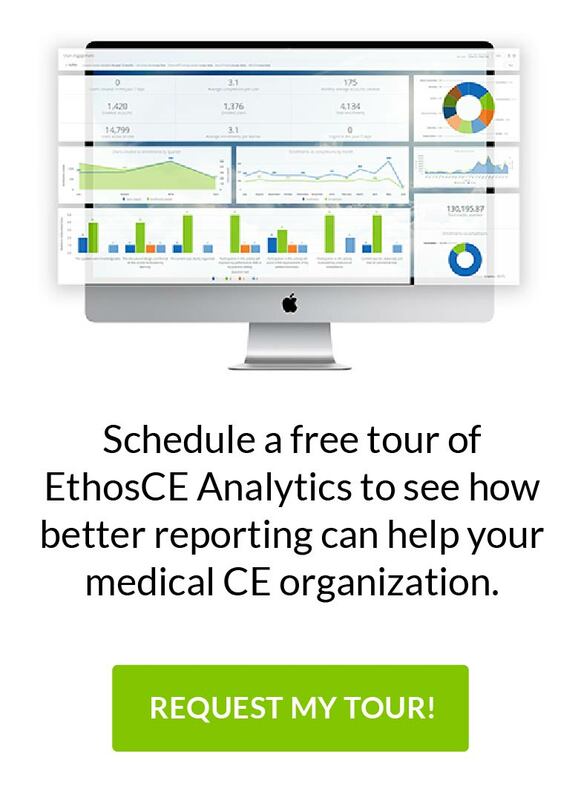 We are already looking forward to next year’s EthosCE User Conference and please let us know if we can assist your CME organization in anyway. Call us at 267.234.7401 or contact us online!